A Bride’s Story (乙嫁語り – Otoyomegatari) is a historical romance manga by Kaoru Mori serialized in the bimonthly magazine Fellows! since 2008. 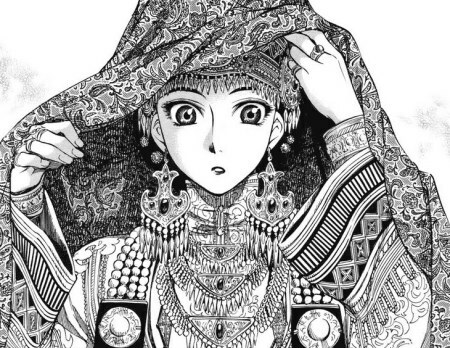 The manga offers glimpses into the lives of various women in central Asia at the end of the 19th century. The first bride in the story is Amir, a girl who marries a boy eight years younger than her. Tarasu is the second bride, a widow who encounters a traveller from England. The third set of brides are the mischievous twin sisters Layla and Leyli who live on the shores of the Aral Sea. Otoyomegatari tells a warm story where everybody lives a happy life. Work and family are the center of the daily lifes of the characters. Being a story about brides, love is a recurring theme in the series, but it’s subtle, built slowly through the interaction of the characters. Take for example the twins, Layla and Leyli, a couple of whimsical teenagers eager to marry any handsome rich guys who could give them anything they want. But due to an agreement between their relatives, they are instead engaged to Falsami and Saamahn, their childhood friends. Frustrated and angry, they had to accept reality and date these boys. I enjoyed how the twins suddenly feel in love with their designated partners, as these boys were willing to go the extra mile to show the gals they were worthy companions. The details of the clothing are superb. On the other hand, the artwork is not just for show, sometimes the autor let’s the story be told by itself without dialogues. 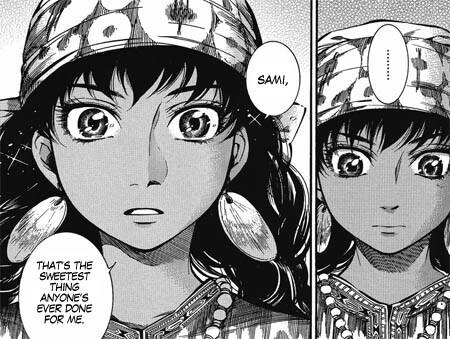 In the first story, Amir is married to Karluk, but due to the age gap and the fact that they didn’t really know each other before getting married, she doesn’t seem to look at Karluk as someone close. However, after her family tries to cancel the wedding and get Amir back by force, Karluk fights back and protects his wife. Looking at how much he cares about her, Amir changes completely and now it looks shy and fidgety when he’s around. There’s no need for dialogues to show her feelings, most of the chapter she doesn’t say a word, but we can see her reactions. Even towards the end of the chapter, when Amir finally feels at ease with Karluk, the author closes the chapter with four pages without any dialogue at all, showing only how happy both of them look together. A Bride’s Story is a superb manga that will make you feel better after reading it. It’s solid entertainment.